Welcome to the most intuitive and powerful online reputation management tool. This guide is designed to get you up and running with 5StarRocket in just a few minutes. Let’s get started! Once you have signed up for an account, you will be directed to 5StarRocket Dashboard (Dashboard Guide) and greeted with our quick and easy setup wizard. Hitting the Let’s start! Button will guide you through the 6 step setup process. Step 1: Enter your business name. Enter your business name here. All emails sent to your customers would be from your company. A customer would be more inclined to open an email from a company that they are familiar with so be sure that this field accurately reflects your business name. This is the page your customers will be guided to for sending feedback. Keep in mind that you can’t include special characters other than dashes (-) (no spaces) and any uppercase characters you enter will automatically change to lowercase. 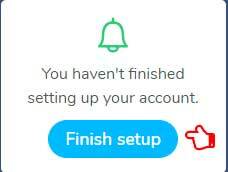 Your account has successfully created. Hit the Finish setup button to complete the onboarding process. Along with this guide, we encourage you to take a look at our Dashboard Layout guide as well. It contains steps to personalizing your account to match your company’s goals. Hitting the Do it button next to Upload your logo in the Onboarding window will take you to your Dashboard under Settings → Appearance. In here you can customize the look and feel of your emails by uploading your logo and background image. We strongly recommend taking a quick look at the Appearance Tab blog which will guide you through uploading your logo and background image. Once done. Hit the Finish setup button to get back to the Onboarding window. Hitting the Do it button takes you to your Dashboard under Settings → Social. We have an excellent article on the Social Tab that we recommend. 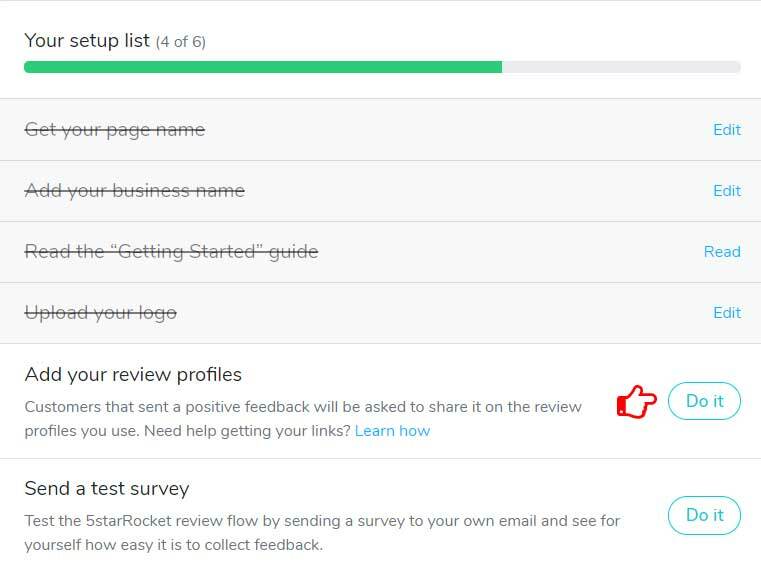 Customers that sent a positive feedback will be asked to share it on the online review profiles you use. 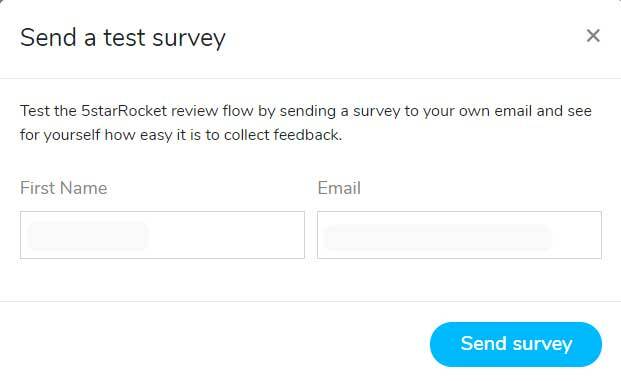 In this final step, you can test 5StarRocket online review management flow by sending a survey to your own email. 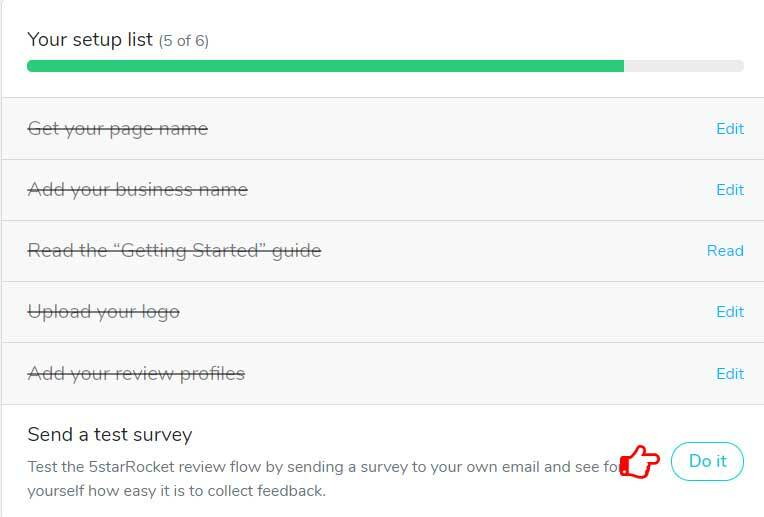 After clicking the Do it button on the Onboarding window, you will be greeted with the Test survey window (pictured below). It will be pre-populated with your first name and email. Simply hit the Send surveybutton and you are done. Be sure to check your inbox for the test survey.